When I am going well, I am up before dawn writing. I watch the sun rise through the window that sits before me. Through it, our neighborhood incrementally emerges from near-blankness. Our house sits on the outside corner of an L-shaped street; from my perch I can see down both sides of the street that comprises our tiny little eddy of a neighborhood. One way, the street runs about five houses down to where it meets another side street and ends, the other way goes about six or seven houses before it intersects busy Glendale Ave. Directly in front, I look squarely at the house on the inside of our corner; a chipping, peeling rental house in muddy browns and rusty reds. Randomly planted palm trees just behind the sidewalk grow untended like a parentless family in the crushed red granite of the yard. 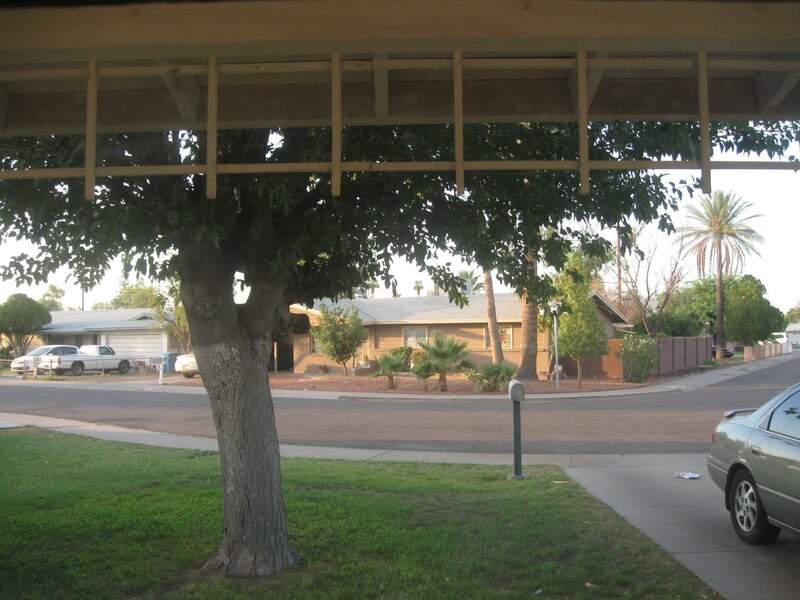 The words “Cactus Wren” float just below the branches of our mulberry tree, angled slightly because the silver post holding the street sign is out of plumb. In these early, swirling hours I sometimes hear the freight train’s whistle as it moves through the city some three miles away, but I don’t today. During the day I can watch the airliners coasting in to land at Sky Harbor, often in pairs gently being led to the ground, like Noah’s Ark in reverse. Right now, the sky is clear and quiet; it’s too early. Today’s sunbreak begins when the first rays clip across the gabled panels of the neighbor’s carport, smearing a glowing orange along the house between the front door and the window. It fades away, sunlight eclipsed by trees, but the message has been sent. It is June 18th, a Saturday, among the longest days of the year. I see the sun in the treetops now, shining off the transformers and crossbars and metal parts of the T-shaped posts standing in the alley that lay behind the homes, shouldering the electrical lines that feed each house. The glow brightens, and the yellow light skips sporadically across the roofs to the left and right. Already it’s obvious; there is no stopping the day now. The relentless purpose of the sun must be acknowledged, only minutes after rising. The shade drips off the trees, it evaporates, it recedes into the leaves and bark. More swathes of light penetrate the neighborhood: a citrus tree’s glossy deep green leaves are shining bright golden green, the striated side of a date palm ignites at its base, the sun touches the bottom branches of our mulberry trees, then the white lattice framing our porch, and then the inside of the window where I sit. The sidewalk illuminates in places like stretched out sparks, the corner of the neighbor’s garage flares with intense whiteness. Birds begin to take positions on the wires above, flutter up and down between the trees and the ground, jet across a piece of sky broken by branches and poles. They know it too, the birds. The day is here. It’s 5:47 a.m. Each house is now marked by sunlight. The black street itself holds patchy sunlight pools that widen with each added moment of time. A black cat strolls across the neighbor’s driveway, casually passing under the car and through a bunched stack of cans and containers tucked up by the garage door, leaping thoughtlessly to the top of the half-height chain-link fence before mysteriously and effortlessly changing its mind and dropping back down, like a slow drip, from the fence, and just as casually, strolling back through the containers and under the car again. Two grackles land in our yard, inspecting the grass intently: hunters. The edges between day and night have become clear, defined, blade-sharp. The brightness of the day bears down; shadows are forced to move, retreat, concede their territory. The light seems to be touching everything, even though there are still wide areas of shadow, mostly at ground level, or the sheltered sides of houses and fences. The metallic sheen of parked cars gleams harshly, even though the cars are old and beaten. A tilted trailer parked along the gutter of the road shines beyond new now. The same black cat scampers inside the chain fence, tail up but bent at the very end, hopping playfully several times before disappearing beneath the shade of a juniper. The movement of the birds has become constant, criss-crossing in front of our window, moving within the trees and along the ground. It’s 6:23. The special time of the morning is almost over. From this point on, the sun will only increase in intensity; it will completely dominate the day. Shadow will shrink and huddle fearfully wherever it is, and the activity in the neighborhood will increase. The revelation of every detail will accelerate, be overwhelmed and become a blur. The newspaper sits in the driveway, wrapped in plastic, sending out its impulses to engage the day and the world, to separate me from my perch.